There is a very simple way to eat more and weight less. If you are struggling with weight loss, you are not the only one. Most people struggle with weight loss. Most people undergo crazy diets filled with processed foods just to lose weight. Fat-Free and Low-Calorie does not mean the food is healthier. Instead, I challenge you to look at your diet and crowd out. 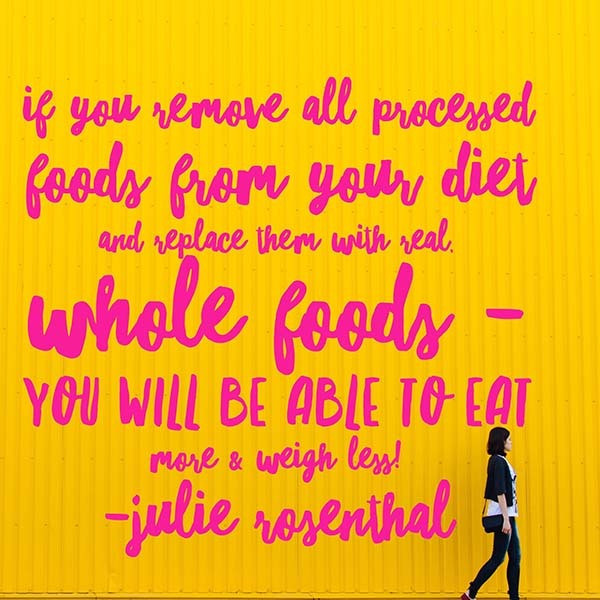 And what that means is to take out processed foods and replace them with whole foods. The idea is not to starve your body, but instead to fill yourself up with foods that will nourish your body instead. By doing so, you shed the weight and feel full at the same time. We as a society are not trained to look at labels, but instead marketing. I myself used to be a victim of this. When I was diagnosed with Celiac Disease in 2006 the farthest I got when it came to reading labels was to make sure it was gluten-free. I never looked at anything else until I went to nutrition school in 2013, and during that time I was blown away. I was blown away because sugar was in everything. Because some of the products I ate were complete garbage and because they were stamped low-calorie or fat-free or organic, I assumed they were healthy. I didn’t know how to read a label, and when I learned – the term blown away had me again. I learned that if you can’t understand the ingredient or don’t know what the ingredient is, don’t put it in your body. If you have to whip out your phone and google an ingredient – chances are it’s not safe for you to eat. I learned that added sugars are different then natural sugars, and not all natural sugars are created equal. I learned that there is even such a thing as too much natural sugar. I learned that there are different types of sugars, and they process differently in our bodies. I even learned that many products label themselves as gluten-free, and are not even gluten-free! I learned that the less ingredients in a product the better. 1 ingredient is ideal. 3-5 is standard for clean eating and anything more is ditch worthy. I learned that eating whole foods and non-processed foods are the way to go. I learned that there are very easy ways to eat clean, naturally, whole food, real food based without compromising your foodie lifestyle, in fact it’s better! And with this way of eating you CAN eat more and weigh less. Of course there is a learning curve! But isn’t there always? Anything that you learn that is new has a learning curve. A new language, a new computer program, a new job, a new form of yoga, a meditation class, knitting, painting really anything has a learning curve. A diet or a lifestyle is no different. There are two ways to do this. You can start off slow or you can cut everything out and start over. And there is a ton of grey in between that. Getting healthy means something different for each person. If a medical condition or Autoimmune Condition is involved – I would always recommend to skip the transition and grab the bull by the horns. If you just want to get healthy for non medical benefits, you have more flexibility to start slow. Either way you choose, you are taking a step forward and that in itself is remarkable! 1.Focus on whole foods which means hang out in the produce section of your supermarket. See with your own eyes just how many options outside of a box you actually have. There are SO many fruits and veggies to play with – we don’t realize all of the wonderful sources we actually have. Canned fruit is NOT considered a whole fruit, because it has been manipulated. 2. Then head over to the aisle where there are natural and organic nut and seed butters and take a look at the labels. There shouldn’t be more then 2 ingredients in those! The actual nuts and seeds, with some oil for easy blending. I always opt for the sugar and sodium-free versions, because if you are getting a lot of sugar in other places, does your nut and seed butter need to have it too? And if they do, just stay organic and that will bring you to 3-4 ingredients. 3. When it comes to chips, crackers, pasta’s and other boxed items – focus on real food ingredients to a minimum of 3-5. Trust me, there are PLENTY of these options out there! All ingredients listed should be ingredients that you understand and can pronounce. But this doesn’t mean eat all the Lays potato chips you want because there are three ingredients. Aim for healthier options, and use your intuition and judgement. 4. As for gluten-free grains – skip the mixes that take less time to make because those are filled with additives and powders – and often other chemicals. What you want are the plain whole grains that you cook yourself. When you are at home you can add whatever seasonings, spices, oils, dairy and veggies you want. Whole gluten free grain ideas are millet, brown rice, amaranth, quinoa, wild rice, and buckwheat. What you want to learn to do is crowd out processed foods and replace them with whole foods. By doing so, you will feel more vibrant, you will have more energy and your body will feel better because you are detoxing out the chemicals, additives and sugars that your body isn’t designed to process. 5. Learn to read labels, far and above just gluten-free labeling. If the ingredient label has more then 5 ingredients, ditch it! But also look at the serving size label and learn to read that too. Your area of focus should be on sugar content and salt content on a nutritional label. Don’t be fooled by the marketing on the front of the package that states all natural or organic, or healthy. These are just terms added to a package to sell you the idea that it is healthy. And it’s not always the case. Don’t worry so much about healthy fats you find in avocados, unsweetened coconut, flax seeds, chia seeds and un salted un roasted nuts and seeds, because those are healthy fats, and believe it or not, healthy fats are something your body needs to function properly. But do focus on trans fats, and unhealthy fats like those in fried foods, potato chips and other junk items. 6. Decrease sugar immensely!!! Sugar drives weight gain. Sugar drives cholesterol. Sugar drives Cancer cells and sugar drives Diabetes. Sugar deconstructs your immune system and allows more infection to grow, more yeast to grow and more bacteria to feed off of the yeast. Sugar also plays a very negative role in any Autoimmune Disease, not to mention more superficial things like acne, sleep patterns, skin conditions, weight gain and mood. So reduce the amount, eliminate it or change the source. 7. Learn about sugar content. Look at the label and see how much sugar is in a serving of what you are eating. 25 grams of sugar in one small cup of yogurt is a lot of sugar. I know this is not something we all look at. We think it’s healthy because it’s yogurt, or any other product. But it’s a lot, and there are ways to cut that back. Opt for a plain unsweetened yogurt and add your own healthy toppings like fruit, nuts, seeds, flax, dark chocolate chips, gluten-free oats. There is another myth around town that goes by the name of coconut water. It’s LOADED with sugar, and yes it’s natural sugar but it’s still high in sugar. Just 1 cup is 15 grams of sugar, and just one small bottle has at least 2 servings if not more of coconut water. It’s time to start thinking about how much sugar your body actually needs, and start to reduce if not eliminate it. 8. Learn about the different types of sugars. There are high fructose sugars and these are also found in fruits, and then there are low glycemic sugars that are also found in fruit. Blueberries, strawberries, raspberries, kiwi fruit, grapefruit, green apples, blackberries, cantaloupe, honeydew melon are lower in sugars then sugars found in pineapples, bananas, mangoes, grapes, watermelon and others. In addition to fruit sugar, there is also non-refined sugars that are better to bake with then white cane sugar and brown sugar. These sugars process better in your body if you choose to use sugar. Examples are: maple syrup, maple sugar, date sugar, coconut sugar, stevia, yacon syrup and lucuma powder. Agave is considered just as bad as white sugar, coconut nectar and date syrup although considered more whole, are still loaded with sugar and actual dates although a fruit, and loaded with fiber are also high in natural sugars. We all want a sweet treat every once in a while, or even every day – that’s totally cool, but start to experiment with different types of sugar and see how your body feels and reacts. Learn to not need it in everything! Learn to balance it all out. So you can see that there is a lot of different ways to look at sugar. And given the type of autoimmune disease you have, the medical condition you bear or the state of your health will determine how you want to live with sugar in your life. 9. Make more meals at home. This way you know exactly what is going into your meal. 10. Stick with grass-fed and antibiotic free / hormone free meats, poultry and eggs. Why you ask? Good question! When the animals are being treated for infection they are injected with antibiotics that end up still living inside the animal tissue when slaughtered. When that meat hits the market, you are eating the antibiotics used to treat an animal. The same goes for hormones. There are many types of hormones injected into an animal at any given time to make them produce more and grow more and at a faster rate. Those hormones live inside the tissues of the animals you are eating. Choosing to eat animals that were raised right, treated right and free of hormones and antibiotics that are grass-fed are going to feed your body differently then infected and injected animal products. By eating this way you are removing toxins that don’t belong in your body, and by doing so your body will function better, you will feel better, you will look better and you won’t get sick as often because your immune system will run properly. 11. News flash! White potatoes convert to sugar immediately! And guess what? Eating them will not make you feel satiated. You may feel full at first, but because they convert to sugar so quickly, and do not provide a lot of nutrients, you end up feeling hungry. So try a sweet potato, butternut squash, acorn squash or another starchy vegetable instead. Starchy veggies have a lot of fiber and vitamins stored in them, where a white potato may make you feel very constipated. 12. Dairy can be really inflammatory to the gut and immune system. So try eliminating it if you are not feeling well or always getting sick, or always getting sinus infections. There are so many dairy-free options out there! If you still must have dairy in your life opt for grass-fed and organic as it is processed differently. And to all my gluten-free Celiac peeps out there – most soft cheeses are off limits. 13. You don’t have to give up chocolate to be healthy! Opt for chocolate brands that are 70% dark or higher in cocoa content. You may also want to experiment with chocolate brands that sweeten their chocolates with coconut sugar, stevia or other types of natural sugars over cane sugar. 14. Reduce your caffeine content! First off drinking too much caffeine messes up your moods, your sleep patterns and your adrenals/cortisol levels, and secondly you retain a lot of water, which in turn looks like weight gain. So opt for caffeine free or no caffeine at all. If you need that energy boost try a green juice or a green smoothie. 15. Option for Organic fruits and veggies over non-organic. Mainly because of the pesticides sprayed on the the crops. The pesticides are meant to kill and harm bugs, not humans. The downside to consuming pesticides on a daily basis can be extremely harmful to our bodies and our immune systems. If you cannot afford all organic foods because they are more expensive, then do what I do and follow the clean 15 and the dirty dozen. This is a list created by the EWG that specifies the dirtiest fruit and vegetables that must be bought organic and then the fruit and veggies that you can buy regular that are safer. Check out my article on eating organic for this list. 16. Last but not least DRINK LOTS OF WATER! Half the time we think we are hungry we are really dehydrated. Most people in this world do not drink enough water. Our bodies are comprised of over 70% water, so imagine a body made predominately of water lacking water? How you choose to implement these tips into your life is totally your call. You have to start somewhere, and whatever you are able to tackle now is enough. You are a rockstar for trying to better your body! Know that! Ok loves! I hope these tips have helped and if you have any questions, feel free to shoot me an email HERE! Love & Clean, Real Food, Healthy Living!